Are you tired of meaningless “awareness” campaigns and pink ribbon promotions? Want to help address and end the breast cancer epidemic but don’t want to contribute to Breast Cancer Awareness Month a.k.a. Breast Cancer Industry Month? 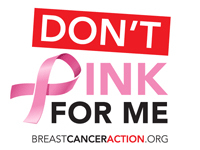 Join Breast Cancer Action in challenging pink ribbon culture by starting your own “Don’t Pink For Me” fundraising page. Tell your friends and family “Don’t Pink for Me” and ask them to make a donation to Breast Cancer Action in your honor instead of buying pink ribbon products. Breast Cancer Action’s work to end the breast cancer epidemic cuts through the pink noise to tell the hard truths about this disease and challenges “pinkwashing” hypocrisy and the pink ribbon culture that have become the status quo of the breast cancer industry. We can put women’s health first because we are free from conflicts of interest. Stay up to date on our signature action and educational Think Before You Pink campaign by following us on Facebook and Twitter and sign up for our action alerts.